Hayling Island was a small rural community (population 576 – 1801 census), largely given over to farming and fishing. It was pretty self sufficient with water being drawn from wells and most produce available from the farms. Connections with the mainland were the wadeway to Langstone and the ferry across the Langstone Harbour entrance connecting Hayling Island with Portsmouth. These links were sufficient at the time. In 1824 the Portsmouth & Arundel Canal cut through the Wadeway and a wooden road bridge was constructed to re-connect Hayling Island with Langstone. A toll was charged to use the bridge. Farm products now had a much improved route to local markets. The improved access to the Island with the building of the road bridge, kick-started the tourism industry. The Norfolk Crescent (a terrace of lavish town houses) and the Royal Hotel were constructed in 1825. A stage coach connection, using the turnpike roads, was established between London.and the Royal Hotel. With little support for developing this further, the Norfolk Crescent was not completed to create the envisaged grand crescent. 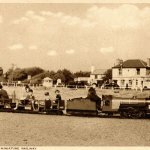 The story continues with the construction of the Hayling Branch line along the original 1860 (modified in 1864) route across Langstone Harbour. In 1864, The South of England Oyster Company leased 300 acres of reclaimed mud lands to create the Oysterbeds to farm oysters. 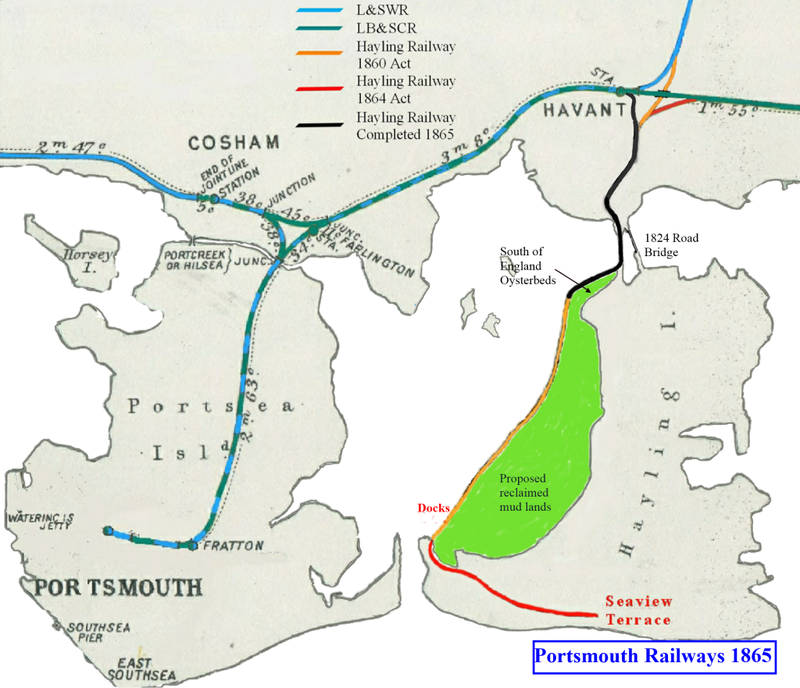 Other Oysterbeds were already in existence on Hayling Island but the South of England Oyster Company was developed as a direct result of building the railway line. When the railway line was completed in 1867, the railway was involved in the movement of Oysters. In 1877 a Gas Works was built next to the station providing gas street lighting for the first time on the Island. The island population had increased to >1600 in 1901 and tourism continued to grow with the easy access provided by the railway. By the mid 1920’s the population in the summer months had grown to such an extent that the wells were at risk of being unable to supply sufficient water. In 1928 water was pumped to the island to supplement the wells. The Hayling Island Gas Company was absorbed by the Portsmouth and Gosport Company. Gas was then supplied from Hilsea and piped onto the island.This article from the Evening News, Aug 6 1937, describes the formal handover and the closure of the Gas Works. Langstonian found this advert in a 19th Century almanac. 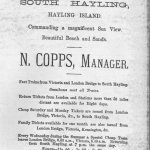 This is advertising the Royal Hotel, Hayling Island and has much information on travel and fares. At the same location a couple of years ago, the Hayling Seaside Railway's visiting Bagnall 0-4-0 Saddle Tank steam locomotive "Wendy", owned by the Bursledon based Hampshire Narrow Gauge Railway Society, can be seen waiting to leave the present Eastoke Corner station bound for Beachlands.